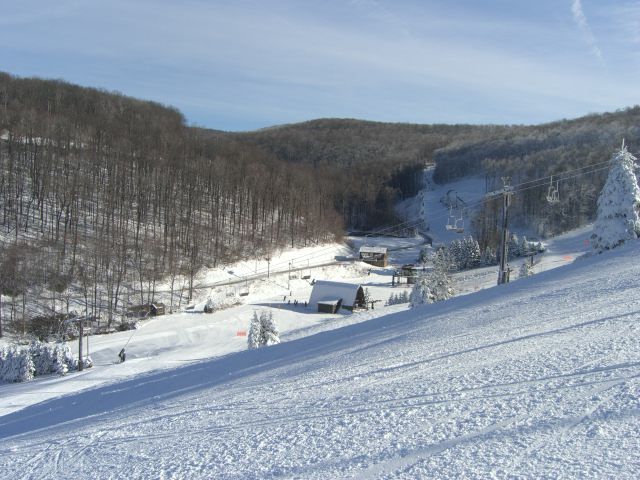 When the weather forecast said sunny and 18 degrees, I knew that it would be a perfect ski day anywhere in the Laurel Highlands. With temperatures under 32 degrees day and night for the last week all the resorts have been making snow 24/7. When you have cold temperatures and low humidity the quality of the snowmaking rivals natural hard pack. This gives the snow rider a consistent surface and snow that makes even a beginner look great. Getting up to 7 Springs at the start of the day is important, it gets you into the lower parking lot and you get out on the hill before the crowds. Having a locker in the ski lodge makes it easy for me to get into gear in about 10 minutes and be out on the slopes in less than 20 minutes from parking the car. Conditions did not disappoint me, as every slope except Alpine was open and near perfectly groomed. The photo is looking at the North Face Lift from the lower third of Giant Boulder Trail. The entire back was open to include all of North Face, Giant Steps, and Gunnar. When I got back into the lodge I headed for some hot coffee with the cashiers for the coffee shop. They shared that they had been busy but not jammed. A swing through the Hidden Valley parking lot last weekend would indicate they too are enjoying solid early season skiers. Ski Ya! Yes it was an awesome day at the Springs, Christmas left much to be desired, but see the season off to a great start.